Disclaimer: Tyndale House Publishers provided me a complimentary copy of this book. Nonna Bannister lived the majority of her life without sharing her Holocaust experiences with those she was closest to, not even her husband. Near the end of her life, however, Bannister revealed her complete story, first to her family and now with the world. 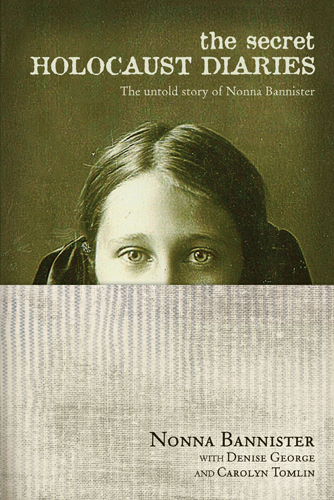 The Secret Holocaust Diaries: The Untold Story of Nonna Bannister is a haunting and poignant memoir of a young lady whose innocence was shattered by the brutal savagery of WWII. Although Nonna’s story is a powerful one, the book drags early on. Nonna’s attention to detail is quite impressive, but the myriad details with regard to her family context (names of family members, dates of birth, anecdotal material re: how family members met, etc.) contribute to a too-slowly developing narrative. Nonna’s memoir would benefit from tighter editing; the first 120 pages could easily be edited down to around 40-50. But the narrative really takes off as Nonna recounts the tragic death of her father and the ensuing experiences she and her mother faced in SS Germany. It is a chilling tale; by the age of 16, Nonna was the lone surviving member of her family. Hers is a tale of innocence lost and a commentary on the enduring quality of the human spirit, persevering in spite of all odds. The text’s editors (Denise George and Carolyn Tomlin) provide copious notes throughout, providing readers with insights taken from Nonna’s other writings, explanations of untranslated words and phrases, etc. I found these notes to be quite helpful. This entry was posted in Books, Faith, Social Issues and tagged Holocaust Diaries, Nonna Bannister. Bookmark the permalink.